This article has been shared through our submissions page, where you can share your own features too. 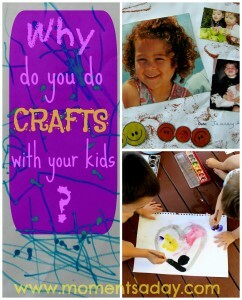 Have you ever been browsing Pinterest kid crafts and thought, “Wow these are some awesome ideas and I bet my kids would have a lot of fun doing them, but there is NO WAY I would try that at home.” I used to feel this way all the time and was beginning to wonder why our crafts didn’t quite look up to scratch. That is why I have put together 3 practical rules for my family that I can focus on when sharing craft time with my kids. We may not do many truly Pinterest-worthy crafts, but we have fun, I enjoy the simplicity of the activities, and we craft our own specific purpose in mind. Come read the rules for “crafting” in my home – and if you aren’t a mama that enjoys tubs of glue and glitter, you will be assured that you are not alone. Five Family Family Fitness Tips! Free June Kids’ Activity Calendar!